Parashakti was born in Jerusalem, Israel, and descends from a long line of spiritual teachers. 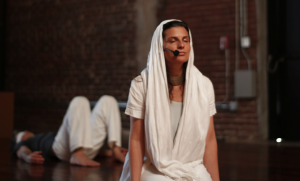 Exploring the essence of spirit and dance from the age of four, Parashakti moved to the United States, where she spent two years studying yoga and living at the ashrams of Integral Yoga. At the ashram she began her studies of Trance Dance™ with Shaman Wilbert Alix, which drew her to the wisdom circles of Native American ceremonies. Both of these profound in-depth teachings and inspirations led her to develop the powerful, life-changing process known as Dance of Liberation™.Dance of Liberation is based on seven foundations, each of its seven steps is a mini-template of a transformed way of life. A way of life filed with exuberance. One rich with direction, purpose & service. Parashakti has worked with over 10,000 dancers from around the world and led workshops and retreats at some of the world’s leading holistic centers including:The Tree of Life (Arizona), Esalen Institute (California), Jivamukti Yoga School, Omega Institute (New York), Alexis Zorbas Retreat Center (Greece), Zorba Festival (Israel) & Ubud (Bali). Parashakti has co – produced a full feature documentary: Dance of Liberation in collaboration with the Wolper Organization at Warner Brothers. She is also the co-creator of Parashakti Lifestyle, a fair trade ceremonial white clothing line. Parashakti continues to teach at Ecstatic Dance LA, NAAM Yoga, Wanderlust Hollywood + Wanderlust Yoga Festivals, Omega Institute & Jivamukti Yoga Center.